It seems harmless enough. You share some personal yet titillating information one co-worker told you in confidence with other co-workers. What’s the big deal? workplace gossip in the bud. According to a study done by the Georgia Institute of Technology, 15% of all workplace emails include gossip. VPs and directors are the most likely to spread gossip. Gossip is as frequent in formal conversations as it is in informal conversations. 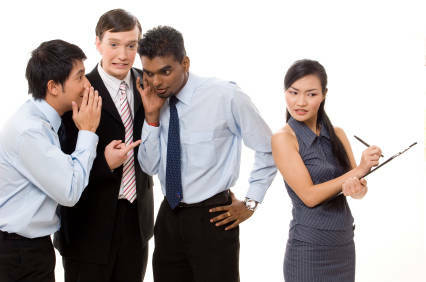 Managers who have teams that are negatively affected by gossip often hear things like, “Why can’t you manage your team?” Besides the immediate negative effect on morale and productivity, you inability to keep gossip under control can derail your career. Is this fair? Maybe it is. That’s because gossip is almost always the result of poor management. Clean up your management by setting clear expectations and setting a proper example, and you can clean up the gossip. Here are some tips that can help managers and leaders nip gossip in the bud. • Set a good example. Don’t gossip. If something is told to you in confidence, keep it to yourself. If you have an urge to say something about someone that is mean, negative, casts someone in a negative light, or has the potential to create rifts, don’t do it. A good rule of thumb when trying to decide if something is gossip or idle chit chat is to ask yourself if you would say it to the person’s face. If you wouldn’t, then don’t say it to anyone. • Don’t listen. Just because the words aren’t coming out of your mouth doesn’t mean you’re not actively participating in the rumor mill. If you’re listening, you are actively promoting gossip, even if you don’t say anything. Change the subject, say something positive, or simply walk away. • Make it a policy. Even if gossip is not addressed in company policy, make it your policy. Let employees know that gossip will not be tolerated, and that they should not tolerate it from others. • Stop it in its tracks. If you find that someone has gossiped confront them directly. Tell them exactly how gossip negatively impacts the workplace. • Communicate consistently and regularly. This is probably the most important point. If employees know what is going on in the workplace and feel as if they are being kept “in the loop,” they will be less likely to gossip. Don’t let gossip destroy your team, your department, your organization, or your career. Know that you have the power to stop it.